MPBC’s CW Visible Fiber Laser Series are an ideal choice for applications where wavelength stability are paramount. Available wavelengths: 488 nm, 514 nm, 532 nm, 542 nm, 546 nm, 560 nm, 570 nm, 580 nm, 583 nm, 589 nm, 592 nm, 595 nm, 606 nm, 620 nm, 628 nm, 642 nm, 647 nm, 658 nm, 670 nm, 750 nm, 775 nm. Output power range from 100 mW to 5W CW, and are available in a compact OEM modules for system integration or 2RU-Rack mount modules for laboratory use. All units have the same compact size laser head, making the VFLs easy to integrate for system applications. 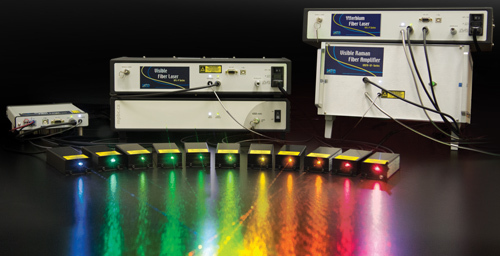 Customized wavelengths available upon request.